by Albert Volwiler. Hardbound, 370 pages, 6" x 9". 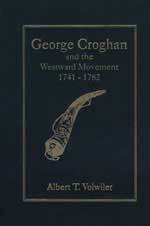 Students of 18th century Indian history are certainly familiar with Braddock, Pontiac, Weiser, and Sir William Johnson, but in George Croghan, we have perhaps the most fascinating and influential of the great American frontiersmen on the early westward movement across the Alleghenies into the Ohio country. Coming into Pennsylvania in 1741 during the Irish potato famine, Croghan entered the Indian trade and soon became the colony's most prominent leader. Failing in Indian trade, Croghan acted as Washington's Indian agent on his Fort Necessity campaign of 1754 and later served with and survived Braddock's fateful battle in 1755. But Croghan's mind was constantly stirred by visions of westward colonization and he disastrously promoted this idea of western land speculation to prominent men of the day. Unfortunately, the men who trusted Croghan generally lost money and most came to distrust him. During the American Revolution both American and British treated him as a traitor and in 1782 he died in Philadelphia a tired and penniless man. This book, however, does not dwell on Croghan's private life but rather concentrates on giving the reader a better understanding of the power and influence he had on the events of the mid 18th century's early westward movement.